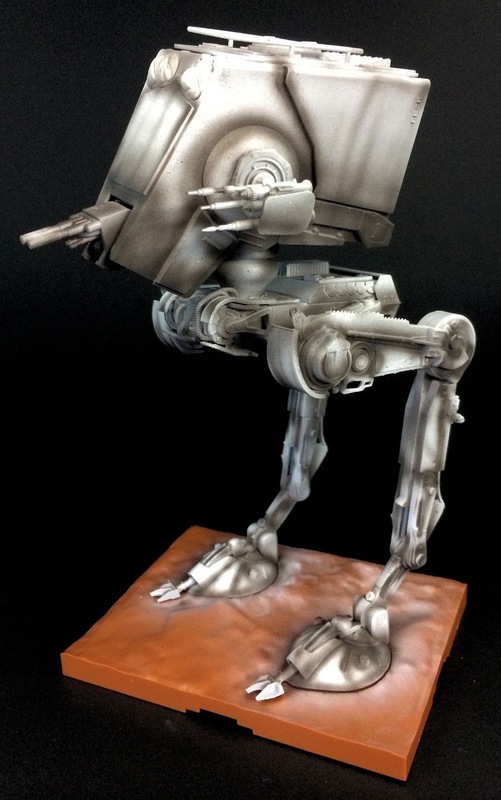 The Modelling News: Review: Bandai 1/48th Star Wars AT-ST - is this the crossover kit we have been waiting for? 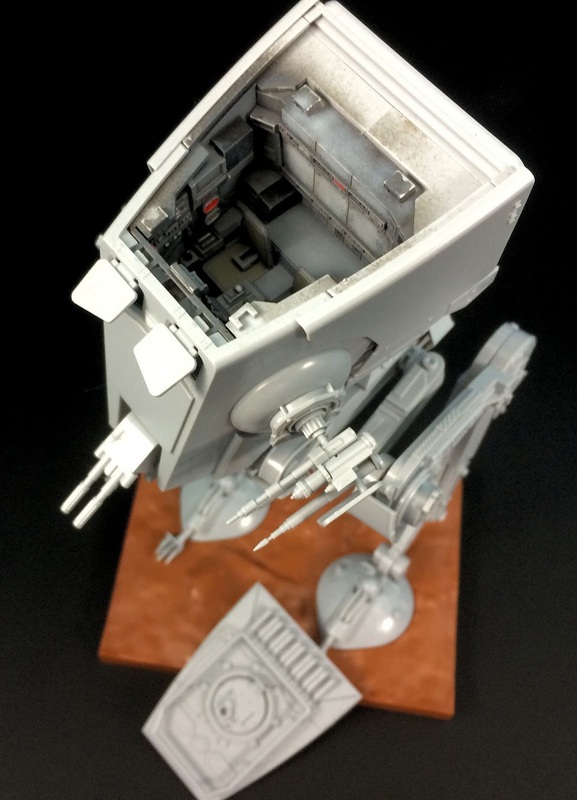 Review: Bandai 1/48th Star Wars AT-ST - is this the crossover kit we have been waiting for? 6 injection moulded sprues plus decals and a sticker. When I was a young-un (a long time ago in a place far-far away) I was a kid who loved Star Wars. Well I was not alone I suppose ‘cos every kid around my age and some of their parents liked the movies as well. It was not surprising that kids loved these movies, the merchandising was mainly aimed at young kids who could buy the lunch boxes, spin off merchandise and other bits but most importantly the FIGURES which were affordable to many kids. Now the figures were cool – but not as cool as the vehicles which were literally from another planet to a kid of that time. The Sandspeeder, the X-wing and Y-wing as well as the Tie fighter and snowspeeder were very cool and your figures went inside them. The Millennium Falcon and the huge AT-AT four legged walker were the best of the best. By the time I actually had money I had long gone past the child age group (25 isn’t a child?) these toys were marketed at – but I WAS able to get a two legged and very cool AT-ST scout Walker. 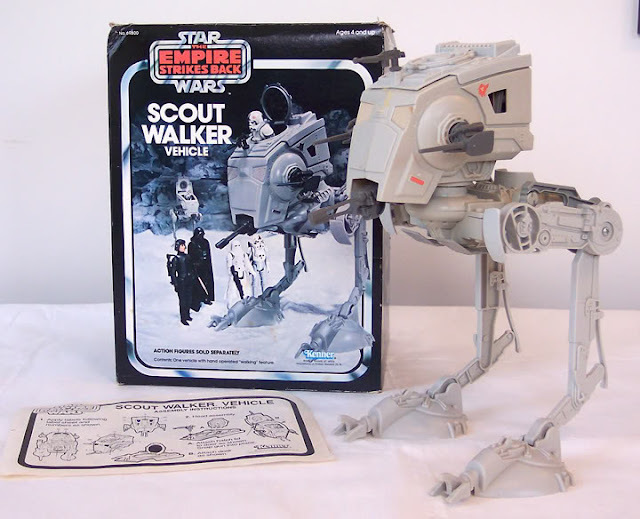 My toy from the original Empire Strikes Back run looked a lot like the one in the picture below, and had a rear button causing the legs to march up and down. 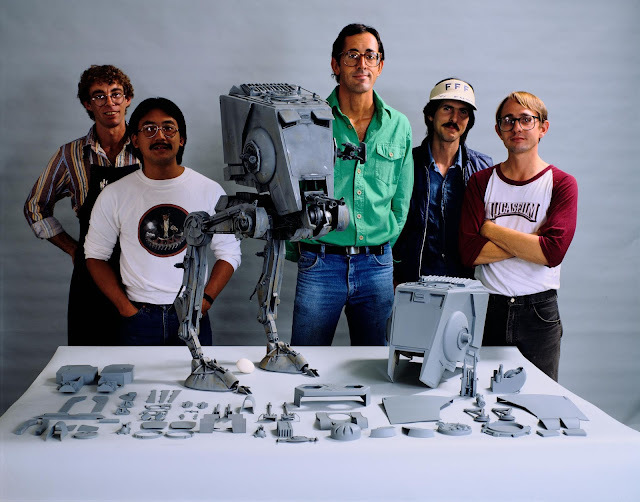 Members of the ILM team with a model of an AT-ST. George Lucas thought it was "neat" and decided to include it in The Empire Strikes Back charging ahead of the AT-AT Walkers. The ILM model makers then added a metal stop-motion armature for it to be used in ESB. 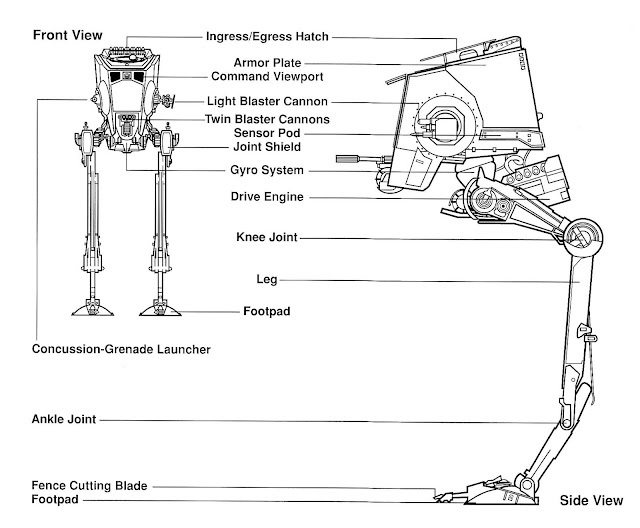 The AT-ST, was also known as a "Chicken Walker" because of its shape and gawky chicken log legs and gait, was a light weight but heavily-armed, ground combat vehicle that got around on legs instead of wheels. Wow! I thought as a youngster when I saw a glimpse of one in “The Empire Strikes Back.” It looked just that much cooler and faster than the larger four legged AT-AT walkers. When I saw “Return of the Jedi” for the first time I was so happy to see them afresh in the movie & frankly I didn’t mind that they smoked a few Ewoks on the way. 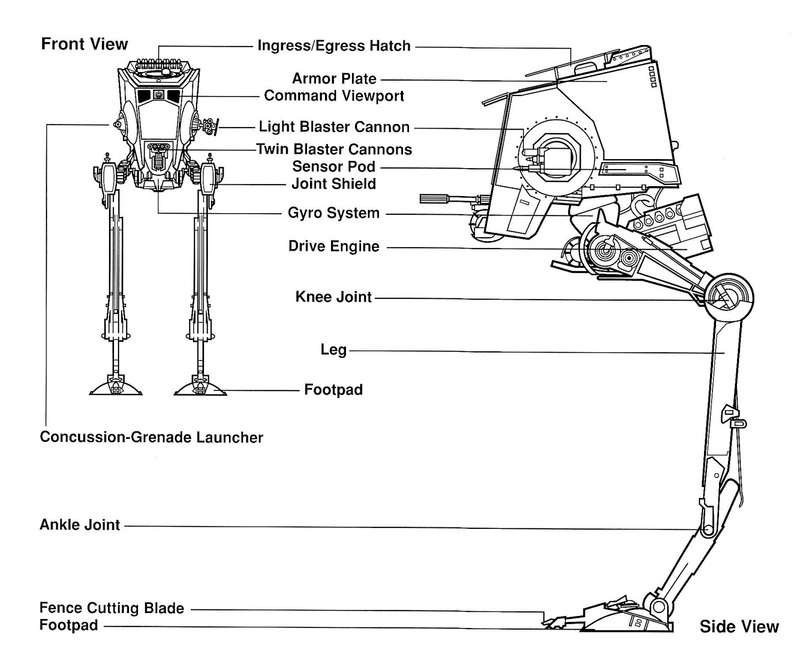 Final AT-ST blueprints for Return of the Jedi, from which the life-sized prop was created. 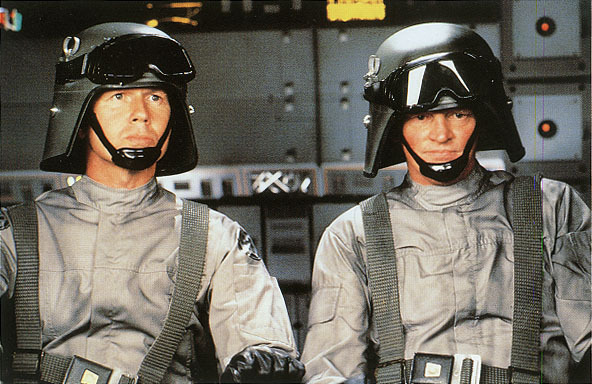 Now there was a slight change in the design between “Empire” and “Jedi”, but the model we are looking at today is the “Jedi” model that we know from the battle of Endor. MPC made a kit of this walker about 30 years ago, but it took a fair bit of skill and scratch-building to make this into a good representative of the real thing seen on screen even though it too was a snap together kit. As modellers we always aim higher than a toy-like kit and so when Bandai of japan, known for making toys and robots signed on the response was mild to say the least. Thankfully modeller’s fears were not warranted with the Star Wars kits Bandai has released so far. The larger figures and the lit up version of the X-wing in 48th scale for example are both detailed like any model aircraft we see on the market and they are in scales we can judge our other kits against – even if it is only for a representation of size and scale quality. When first looking at the box it straight away looks like a quality kit. The clean black card and nice graphics of the box art walker and the side illustrations in full colour give way to a box that seems to bulge a little. Not from the postman’s rash moves but from the large sprues that are packed into it leaving not much breathing space. The parts count isn’t massive but there is a fair bit in here. The instructions are first out of the box. These are in full colour and only fifteen steps are needed to go from parts to scout walker. 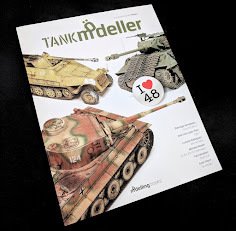 I know for a fact (because we are making it right now) that at least until you have to make the turret – and further by the look of it - you do not even need any glue for this kit. Some of the steps as an example.. The instructions are in Japanese but that will not slow you down if you do not speak that language. Simple numbered sequences are easy to follow and the painting instructions are on the rear of the kit and on the box art. 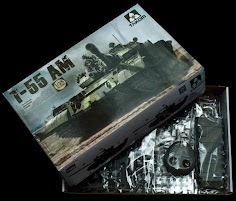 The box opens to reveal a full colour booklet of instructions, a small decal sheet and a small sticker sheet for those who might not want to use decals and six sprues of grey plastic – or should I say five and a half sprues in grey plastic? Reason being is that one of the sprues isn’t all grey. Quite neatly the largest of the runners Sprue A, is moulded in four different types of plastic. One part being grey and containing the leg ball joints and parts of the swivel “pelvis” and armatures - the other being a brown to make up the small base and one of the (temporary) crewmember while the last little part is in a clear red plastic that is almost opaque. These represent the lasers that attach to the large cannon on the chin mount of the walker. A point that many people might notice is that there is another type of plastic on this sprue – on the right side of chewie the parts are a malleable plastic that can be bent. This is engineering you don’t find on models much and especially not on the one sprue! 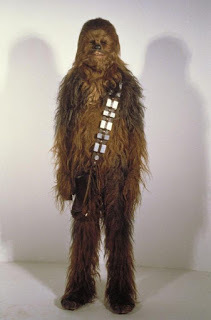 The “Crewman” is none other than Chewbacca – the sidekick and life companion of Han Solo, this Wookie stole one of the imperial AT-ST walkers on the battle of the moon of Endor. It’s a nice surprise to see this popular figure in 48th scale in this kit. He is seen in a pose like he is sitting atop the walker with arms stretched forward holding onto the vehicle. It is more than a fair likeness and no doubt a popular figure for modellers to make their own little Endor recreation. Chewbacca – what a Wookie! For those wondering about the scale of this kit’s figures I found that the official info on him says he was 2.28 metres tall – it just so happens that the I measured this figure of Chewbacca in 48th scale is 4.75 centimetres tall - which if you multiply that by 48 you get…Da-daaa 2.28 metres. The next part of the sprue in brown is the small base that the walker stands upon. It is good to see this included as the model makers did not need to include it. 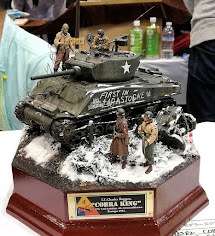 This is again the model makers displaying their toy-making roots and including things that toy collectors might take for granted but model makers do not expect. The base also holds the feet pretty firmly so you model does not topple over due to its high centre of gravity. The ground anchors the feet with a clicking sound that is very secure without glue. I thought I would show the “lasers” on a white lit up back ground to let you see the opacity of the blasts. 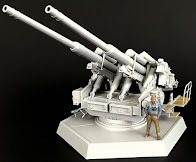 These fit neatly into the slide moulded hollow barrels of the chin cannon and if your figure is in a well-lit place these may look just like effects lasers. Again toy influenced but a bonus to a modeller and you need not include them if you don’t want to. Sprue B shows more of the snap-fit toy history of Bandai whilst also showing off cutting edge slide moulds in the construction. 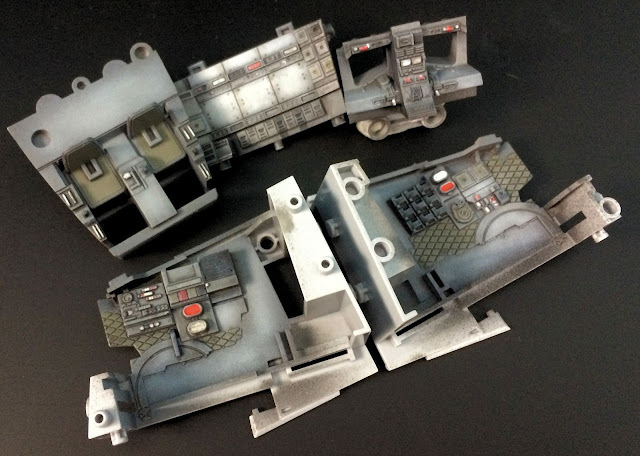 This sprue contains the large armoured turret “head” and the thicker parts of the “thighs” of the AT-ST as well as some of the armament. The large long face of the turret is moulded as one piece on the front. I can remember the MPC kit I had was moulded so that you had to join it together with a large seam on the front. This part is seen with as little visible seam as possible. The joint being hidden on the back of the turret. The visor hatches can be posed open or closed on the run as you please as well as the top hatch of course and you can see here the slots for the armament to securely anchor into. Here you can see the upper thigh part of the mechanical legs of the walker. A wealth of rivet detail is here not just on the front but the sides of the legs for which slide moulding is used to nice effect (you can see the nibs slightly at the bottom of B5 part.) The one part that could smarter is the inclusion of more movement int he legs. Here from underneath you can see the rivet detail and the insides of the leg. This snaps together with the interior part to form a solid and gapless leg piece. To the left of the leg is the twin barrelled laser cannon with hollowed out muzzles. Now we might laugh “why do we need hollowed out muzzles on a laser cannon?” and you might be right. But the clear red bits fit snugly inside these you see? Now it all makes sense, and to be honest they look better hollowed out anyway. 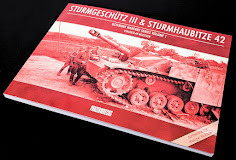 Sprue C1 features the side panels of the top turret as well as the rear as well as the seats and consoles for the pilots and turret hatches. Like plates of armour the parts for the turret all overlap and push in so you do not need any glue ta assemble it. The console area in close up. Limited detail in here but to be honest it will not be seen by anyone but you. You can see here on the right he rear penal of the turret is wonderfully detailed – much more so than any other kit I have seen. On the left is the rear inside wall which again simply pushes into the holes of the outward facing panel on the right to secure it in place. Here is the rear of Sprue C1 – you can see what I am talking about with the holes that mate the outside and insides of the structure together and eliminate the need for glue. Smart engineering by Bandai and I am shaking my head in appreciation as I look at these parts. Sprue C2 includes more of the turret to the top left clockwise we see the two side internal consoles, underside outer shell, the instrument panel, and on the bottom row are the undersides of the turret again. Again these parts are all snap fixes which pop into each other snugly. They make a bathtub of thick plastic with no gaps that encases the crew in this AT-ST.
Sprue D1 of the kit is almost the same as D2 but with some differences. 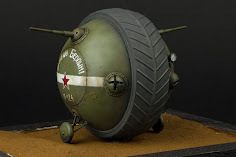 One of the large oval feet top and bottom as well as the left side laser cannons as well as the middle joints of the left and right legs are here. 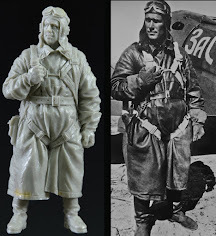 Here you see one of the two pilot figures. The very stiff looking appearance of this figure leaves a little to be desired and Bandai could do better here. With a little work on your behalf you could tighten this figure up a lot. Here he is compared to these two funny looking extras in the film. Here you see the clamshell upper and lower parts of the feet with holes to fit into the base we saw earlier. The two parts on the left are the well detailed middle portion of the legs. 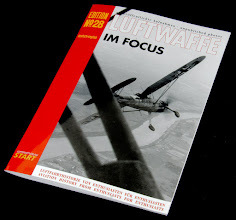 The Very similar D2 sprue features all of the same bits – or so it seems – along with the second pilot and the other foot are more of the joints of the kit and swivel mounts that the kit parts fit into. 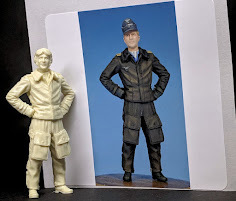 A slightly better picture of the second pilot here shows that he is well detailed, but a little bit of work is needed with him as well. Also included are markings as both stickers (left) and water-slide decals (right). Both an easy to apply but less impressive sticker set and some waterslide decals are supplied here. Again showing the dual nature of this kit. Both sheets are identical but the thickness of the stickers puts them out of all but the most basic modeller’s thoughts. 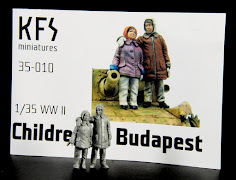 They are great for a very junior modeller though. You can see below the decals in more detail. They could have done a better job with the blaster scar you can apply or not to the hull like is shown in the movie example. A lot of people will make their own with an airbrush and smokey paint. That is all I could find in the box. From the instructions which are well presented to the plastic which is moulded just as sharply as most of the modem kits that are on the market I have been impressed with this kit since first peering into the box. Revell has tried this in approach in the past. 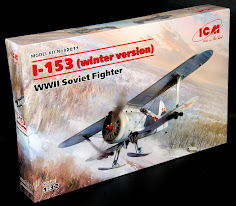 Making an easy to construct model that will please the more casual modellers and absolute beginners. But their snap together kits never really cut it with anyone that would be called a good modeller. 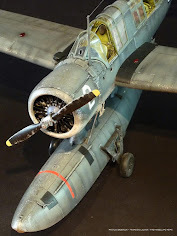 These kits go together nearly without ANY glue, but look seamless and just like the prop from the movie – albeit unpainted and in 48th scale. All the way through as I read the instructions and see that with the ease of construction that joints hide any gaps and leave a flawless finish when completed. No excuses for butterfingers. The hardest part is removing these bits from the sprue. 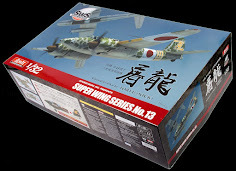 This makes this kit GREAT for learners right through to advanced modellers who want to add their own parts or customize the movement stance of the kit. 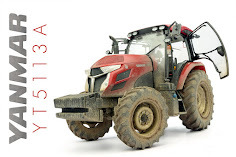 This 48th scale kit from Bandai might be made by a company known for making toys, it might go together with no glue in the ease of a construction toy and it may include stickers – but it also includes 21st century moulding, waterslide decals and some great engineering for a snug fit without too much work on the modellers behalf. 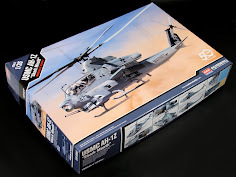 Thanks to HobbyLink Japan who sent us this kit to review and make. This kit is now in stock. For those who want to see the proof of how good this kit is our man Clayton Ockerby is making and painting it as we speak and the second part of this review will come very soon.. – Here are some in progress pictures of the Completed Bandai AT-ST - more to come very soon.. The interior painted up and weathered. The bathtub like structure with painted cockpit installed and removable roof off. 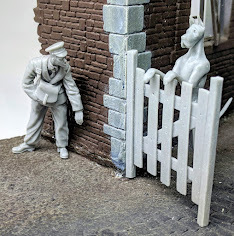 "Black basing" - or as some would call "painting the model" technique - Clayton's build will appear on TMN very shortly...Stay tuned!